The NBA is encouraging its players to be socially conscious. "None of us operate in a vacuum," Commissioner Adam Silver and the head of the players union, Michele Roberts, wrote to players in a letter obtained by CNNMoney. "Critical issues that affect our society also impact you directly. ... You have real power to make a difference in the world." The letter didn't cite specifics, but it comes as professional athletes increasingly speak out about race, including through silent protest during the national anthem before NFL games. The NBA tends to be more progressive than other leagues. In recent years, it has been vocal in addressing social issues, from denouncing anti-transgender bills to promoting gender equality in hiring. "The NBA is of course about much more than a game," the letter said. "Let's continue to use this incredible platform to help and engage with people everywhere -- what we say and do together matters more than ever." It was sent Wednesday, the same day NFL defensive end Michael Bennett accused Las Vegas police of unfairly detaining him, throwing him to the ground and threatening to shoot him. He said he thought, "I'm going to die for no other reason than I am black and my skin color is somehow a threat." NFL Commissioner Roger Goodell said the issues Bennett raised "deserve serious attention from all of our leaders in every community." Related: The NFL is back. Are you? The NBA and its players union sent a similar letter to players before last season. That letter came as NFL quarterback Colin Kaepernick started kneeling during the national anthem to protest how black Americans are treated, especially by police. 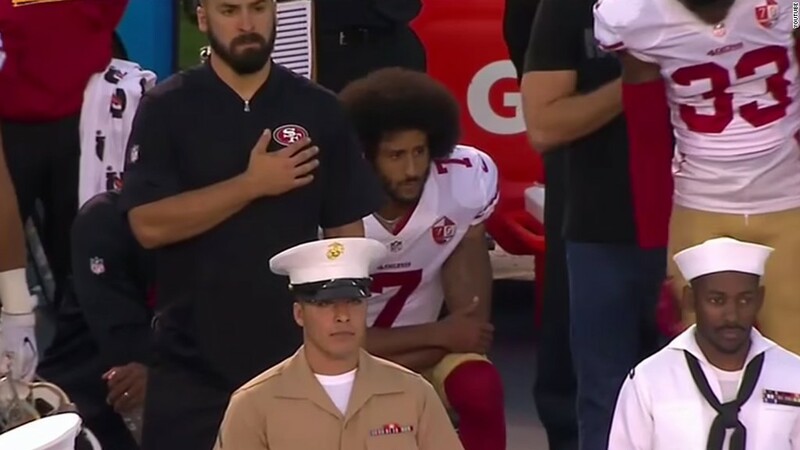 Kaepernick has yet to be signed by a team this season. The protest gained traction in other sports, but the NBA requires players to stand. Last season's letter encouraged players to reach out for guidance on making a statement in another meaningful way. NBA players have spoken out repeatedly. When LeBron James' house was vandalized with a racial slur in June, he said, "Hate in America, especially for African Americans, is living every day." James also refused to stay in a Trump-owned hotel in December because of his feelings about the president. Last summer, Carmelo Anthony hosted a town hall in South Central Los Angeles that brought together the public and the police to talk about race. And two seasons ago, James, Wade and Kobe Bryant wore "I Can't Breathe" T-shirts in support of the Black Lives Matter movement during pregame warmups.